US tycoon Donald Trump could be asked to give evidence about wind farms to a Scottish Parliament committee. Mr Trump has launched recent high-profile attacks about plans for a wind farm off the coast near his golf resort in Aberdeenshire. A spokesman for Mr Trump said the businessman would be honoured by an invitation to address the committee on an issue which was so important personally. The spokesman confirmed there had been discussions about a personal appearance but no firm arrangements had yet been made. 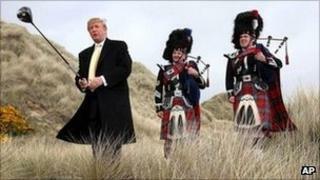 Mr Trump has said he will abandon his proposals for a hotel and houses on the Menie Estate in Aberdeenshire if the wind farm development is approved.